We are a three-and-a-half-star hotel with a unique family atmosphere and with a history over 150 years. We are located in a unique and quiet location above the famous Mill Colonnade, just a few steps from the healing springs, right in the centre of Karlovy Vary. 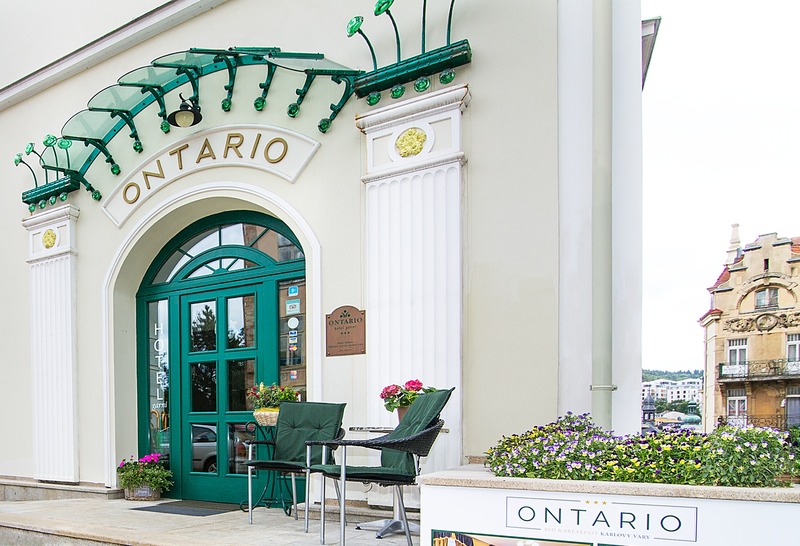 The hotel was built from a historic building named Ontario, built around 1855 and completely renovated in 2003-2005. Our hotel offers 13 comfortably furnished and spacious rooms with unique view of the spa centre and the Teplá River. Right next to the hotel building, there is a parking lot guarded by a CCTV camera system. By clicking, enter the default airport and the departure date. The reception is willing to provide you with a convenient transfer from Václav Havel Airport in Prague or Karlovy Vary by a certified carrier. If you are getting around using your own car, enter your default address and select the most appropriate route. You can park conveniently directly in front of the Ontario Hotel. If you are choosing public or private transport by bus or train, simply enter the default station and select the most convenient connection. The receptionist can provide you with a transfer to the hotel. Company name: Bau-Hold, a. s.
Bank account for CZK: 43-7685200217/0100 Komerční banka, a.s.
Bank account for EURO: 43-4497790287/0100 Komerční banka, a.s.
Czech Trade Inspection, Central Inspectorate – ADR Unit, Štěpánská 15, 120 00 Prague 2, email: adr@coi.cz, web: adr.coi.cz. Under the Sales Records Act, the seller is required to issue the buyer with a receipt. At the same time, they’re required to register the received revenue with the tax administrator online; in the event of a technical outage, within 48 hours at the latest.